Trump Picks Perry to Head Energy Dept., an Agency the Former Texas Governor Wants Abolished (Pt. 2) | Democracy Now! editor-in-chief of The Texas Observer. Part 2 of our conversation on Rick Perry with Forrest Wilder, editor-in-chief of The Texas Observer, and Kiah Collier, energy and environment reporter for The Texas Tribune. On Tuesday, Donald Trump chose the former Texas governor to be energy secretary. Perry famously attempted to propose to abolish the Energy Department—but then couldn’t even remember the agency during a live televised debate in 2011, when Perry was running for president. Perry has deep ties to the fossil fuel industry, including serving on the corporate boards of both Energy Transfer Partners and Sunoco Logistics, two companies behind the Dakota Access pipeline. AMY GOODMAN: This is Democracy Now!, democracynow.org, The War and Peace Report. I’m Amy Goodman, as we continue our look at former Texas Governor Rick Perry, Donald Trump’s pick to be energy secretary. In 2011, when he was running for president, Governor Perry famously attempted to propose to abolish the Energy Department—but then couldn’t even remember the name of the agency during a televised debate. Perry has deep ties to the fossil fuel industry, including serving on the corporate boards of both Energy Transfer Partners and Sunoco Logistics, two companies behind the Dakota Access pipeline. Both companies are owned by Texas billionaire Kelcy Warren. 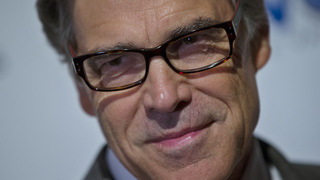 Perry joined the board of Energy Transfer Partners in February of 2015, only two weeks after he left office. That year, he received $365,000 from Warren’s companies. Welcome again to Democracy Now! for Part 2 of our conversation. Kiah, we ended Part 1 of our conversation by talking about Rick Perry’s ties to Kelcy Warren. And we’re not just choosing, you know, one energy—one oil mogul, Kelcy Warren. He is a major figure in Rick Perry’s political career. Can you outline what that is? Again, Kelcy Warren, the head of Energy Transfer Partners, which owns the Dakota Access pipeline. KIAH COLLIER: I mean, Kelcy Warren has been a major donor to Rick Perry. During the most recent election cycle, he was kind of most known for donating, I think, $6 million to a PAC that supported Rick Perry. That money was returned after Perry dropped out of the race. And then, you know, shortly after Perry stepped down as governor in 2015, he was appointed to the Energy Transfer Partners board, where he still serves and would likely have to, you know, step down or sever ties with Energy Transfer Partners, if he’s confirmed as energy secretary. So, they’re close, you know, politically and professionally and personally, from what we know, as well. AMY GOODMAN: And, Forrest Wilder, if you can talk about, overall, though he was governor for, what, 14 years, specifically his involvement in energy issues? FORREST WILDER: Well, I mean, it’s Texas, so, you know, oil and gas business is huge. And during his tenure, we had the shale plays, this arrival of fracking as a force to be reckoned with, and domestic oil production just really soared. Of course, Perry wants to take credit for that. The economy in Texas was relatively good during the recession, relative to other states, and it looks like that had a lot to do with the oil boom, which now is—has been a bit of a downturn. So has our economy a little bit. But, you know, I don’t really—he stayed out of the way. I don’t know that any Texas governor really would have done very much all that different in terms of just letting the shale play go. Unless he had something to do with inventing fracking technology, I don’t know how much credit he really deserves for the fracking boom. FORREST WILDER: —perhaps that’s what Trump sees in him. AMY GOODMAN: I wanted to read for you what your late colleague, Texas columnist Molly Ivins, wrote about then-Governor Rick Perry in 2002. She wrote, “… interesting role of coincidence in the life of Gov. Goodhair. Last summer, the Guv appointed an Enron executive to the state’s Public Utilities Commission and, the next day, Perry got a check for $25,000 from [Enron CEO] Ken Lay. He explained this, to everyone’s satisfaction, as being 'totally coincidental. '” Forrest Wilder? FORREST WILDER: Yeah, there’s been a lot of coincidences. You know, that was early on. And the pattern has repeated itself over and over and over again. You know, we were talking earlier about the—there was a—about 10 years ago, there was a big boom in new coal plants. There was, I think, 18, in all, that were proposed, 11 by the state’s major utility. There was—Perry was rolling in cash from this company and from a former chairman and basically interests. And, you know, all of a sudden he issues an executive order to fast-track the permitting for these coal plants—and a coincidence, I guess, that there was campaign contributions that he and others in the Republican Party were receiving at that time. Plenty of examples like that, these strange coincidences of money and political opportunity. AMY GOODMAN: Kiah Collier, I wanted to go back to the issue of energy. Rex Tillerson, Donald Trump’s pick as secretary of state, the CEO of ExxonMobil, along with Rick Perry as the secretary of energy, what does this mean for the influence of oil and gas on national security policy in this country and our relations with countries around the world? KIAH COLLIER: I mean, it’s, you know, a good sign for the oil and gas industry probably. But it’s also important to note that, you know, Rick Perry was kind of friendly to all forms of energy when he was governor. When he took office, Texas was barely producing any wind energy. When he left office, Texas was the number one wind producer in the U.S. And, you know, he kind of took the same, I guess, approach there, where—that he did with oil and gas, where he kind of got out of the way, you know, created some incentives when he needed to and, you know, expressed public support for, for example, a $7 billion project to build, I think, almost 4,000 miles of transmission lines to carry wind power from the western part of the state to the eastern part of the state, which is more populated. So, you know, I think he might push, you know, more a kind of diverse portfolio like he did here in Texas, where he supported not only oil and gas and coal and more traditional kind of fossil fuels, but also renewables, too, wind power, in particular. AMY GOODMAN: Who had his ear? How exactly did that happen, Texas becoming the number one wind power state in the country? KIAH COLLIER: I mean, it wasn’t, you know, his idea, environmentalists were quick to point out. And I think, like the shale boom and the recent oil boom, the wind energy boom probably would have happened in Texas no matter what. But he, you know, knew it was going to be a big job creator and an economic boon, you know, post-recession. So, you know, there’s a really boisterous renewable energy industry here in Texas, and they donate to Perry, as well. AMY GOODMAN: The issue of the private nuclear waste facility in Texas? Of course, Department of Energy doesn’t only deal with oil and gas. Forrest? FORREST WILDER: Right. You know, I think this is—there’s a long backstory there, but the short answer is that Harold Simmons was a—he passed away recently. He was a Dallas billionaire. He’s the guy who funded the Swift Boat Veterans for Truth ads, the ads in 2004 that attacked John Kerry’s military service. This is guy is obviously very wealthy and a major business player. Through a lot of effort, lobbying effort, and, I would say, political contributions, he was able to get radioactive waste disposal in Texas privatized in 2003 with Perry’s help. Then, in subsequent years, through our environmental agency, they got all the permits they wanted, despite the fact that state engineers and geologists were warning that the radioactive waste dump would leak into groundwater, according to the state’s own—the company’s own modeling. Basically, waste control specialists, such as the Simmons company, got everything they wanted. And I think that this is maybe one of the really classic examples of a kind of style of crony capitalism in Texas that Rick Perry was very adept at. The dump is up and running now and, in fact, is now being looked at—and the company very much wants this—to become a site for storage of high-level nuclear waste, the spent nuclear fuel rods from reactors around the country. So, there’s—it’s possible that the Department of Energy will be taking up this issue at some later date. And I think you’ve got enormous conflicts of interest there for Rick Perry and this whole kind of problematic backstory that folks should really be paying attention to as we kind of go forward with that issue. AMY GOODMAN: Kiah Collier, do you see a push towards privatization overall, Rick Perry in his record in Texas? AMY GOODMAN: This is Ernest Moniz. KIAH COLLIER: Right—was a Nobel laureate. So, I think there’s been a lot of criticism of—so far, of Perry’s kind of lack of qualifications in the realm of nuclear science and—yeah, you know, he just really kind of lacks background there. AMY GOODMAN: And, of course, the first controversy, major controversy, for the Trump transition team has been this 74-question questionnaire put to the Department of Energy to answer questions about employees of the Department of Energy who were involved with dealing with global warming, those who went to U.N. climate summits, etc. Now, of course, that’s before Rick Perry has been nominated, but the significance of this, what people are calling a witch hunt, Forrest Wilder? FORREST WILDER: Well, I mean, first of all, Rick Perry is, unfortunately, a climate denier, and a very strident one. And I guess that’s not that unusual for Texas Republicans. But he was governor of a state that is starting to feel the effects and ravages of climate change. I don’t think Rick Perry is very strong on science in general. I don’t think he’s terribly interested in it, and was able to get away with sort of having that disposition in Texas for a long time. But, of course, now he’s overseeing an agency, you know, as you said, that is filled with experts and people with a scientific background. So I do think it’s—although he’s not responsible for that questionnaire, that’s extremely troubling. And Perry does have—the have been some instances here in Texas of not just, you know, him having political personal beliefs that kind of are in conflict with science, but actually going after state employees—not him directly, but agencies that—where he made political appointees, going after folks who got out of line. The thing that comes to mind is that there was a book that was—a report that was commissioned by our environmental agency, a scientist who’s an expert on sea level rise. His chapter that dealt with sea level rise, including the climate connection there, was basically bowdlerized or censored or gutted—or whatever word you want to use—by Rick Perry’s political appointees, simply, I guess, because they didn’t want—you know, even though this is an obscure report, they didn’t want folks to read about what impacts the Texas coastline was going to have from climate-induced sea level rise. And, you know, somebody paid the consequence for that. So, I think there’s a few troubling signs there. Perry is a very—you know, I’ll give him credit. He is a very charismatic guy. He’s a fantastic retail politician. You know, maybe he gets in there, and he wants to make people happy, he wants to keep his staff happy, and he moves in a different direction. I think that’s what we can—what we can hope for, hope for the best. But prepare for the worst. AMY GOODMAN: Kiah Collier, did you write about this, as well? AMY GOODMAN: What do you mean, his famously bad grades, for people outside of Texas? KIAH COLLIER: I mean, he—so, he got, you know, Cs and Ds during his time at Texas A&M and basically kind of barely passed or, you know, barely got a degree, it would appear from his transcripts, which we got and kind of looked at during his first presidential run in 2011 and posted them online. AMY GOODMAN: As governor of Texas, Rick Perry called an emergency session of the Texas state Legislature a few years ago to ram through this sweeping anti-abortion bill known as HB 2, which was initially blocked by a “people’s filibuster” and an 11-hour stand by Texas state Senator Wendy Davis. Parts of the law were later struck down by the Supreme Court as being unconstitutional. Perry also oversaw more than 250 executions, more than any other governor in modern history. Can you comment on that, Forrest? FORREST WILDER: That’s right. And I think that the House Bill 2, the anti-abortion bill, is a part of his legacy. You know, like almost every Republican elected official in Texas, he is very much anti-abortion. But House Bill 2 was a really bold piece of legislation. It was very aggressive. The result of it was most of the abortion clinics in Texas did shut down. It was litigated, of course, for several years and ended up, as you said, in the United States Supreme Court and was struck down almost in toto as being unconstitutional. So, it was sort of a bit of an overreach on his part with that particular bill. And, you know, I think that they—it’s an open question what happens next, but that’s definitely part of the Rick Perry legacy, is, on a lot of social issues, you know, he’s very much to the right and was sort of aggressive in a lot of the policies and legislation and proposals that he supported. AMY GOODMAN: And the death penalty? FORREST WILDER: Well, Rick Perry oversaw more executions than any governor ever. He did so—and I think this is what makes him a little bit different—during a time in which there was a lot of questions that were raised about wrongful convictions in very high-profile cases that received national and international attention, where there were questions about whether individuals that were executed were wrongfully convicted or in fact may have been, you know, innocent of the crimes they were accused of or convicted for. Cameron Todd Willingham is probably the best-known one. He was sentenced to death and was executed for the arson murder of his three children. However, most of the arson science that was used to convict him has since been thoroughly discredited. There was a Forensic Science Commission here in Texas that was looking into the science or pseudoscience behind Cameron Todd Willingham’s conviction. A report had been produced by an expert that was pretty damning. This thing was moving forward. It looked like it was quite possible that this official Texas commission was going to, you know, completely discredit this case, and Perry went in at sort of the last minute and basically sacked the—gutted the commission and brought that to an end. When he was asked about whether Cameron Todd Willingham may have, in fact, been not guilty and shouldn’t have been executed, you know, he basically said, “Well, this guy is a monster, and he’s a wife beater,” and sort of implied that he got what he deserved. So, he, you know, eagerly signed off on executions, even though there were some very troubling questions about the system. AMY GOODMAN: Forrest Wilder, Governor Perry was indicted. He was indicted for abuse of power in office. Explain what he was charged with and what eventually happened with the dropping of the charges. FORREST WILDER: Well, OK. Yeah, right, Rick Perry was indicted, and a special prosecutor was appointed to look into abuse of power charges. Excuse me. Basically, what happened is that he zeroed out funding for the Public Integrity Unit, which is this sort of anti-public corruption unit within the Travis County District Attorney’s Office. Travis County is the county where Austin, the state capital, is located. And basically, this division was charged with looking into public corruption, often regarding state officials. For example, it was the Public Integrity Unit that investigated Tom DeLay, indicted him. There’s been some other high-profile cases over the years. It’s always been a political hot potato because, for obvious reasons, they have the ability to turn politicians into criminals. And, you know, in this one-party era of Republican rule, that’s usually meant Republicans. And Travis County is run by Democrats, so you could see the problem there. So, basically, the charges centered on whether Perry was zeroing out funding, you know, sort of in retaliation for—in retaliation for the Public Integrity Unit. The charges, a lot of people thought, were rather flimsy, and they obviously did collapse, and he sort of escaped this cloud of—this sort of cloud of trouble, you know, as he left office. And I’m sure he’s very eager to say that his name has been cleared and to kind of move forward. AMY GOODMAN: Well, I want to thank you both for being with us, Kiah Collier, energy and environment writer, reporter for The Texas Tribune, and Forrest Wilder, editor-in-chief of The Texas Observer. Given the—that the government, the new administration is starting to focus now a number of its picks in Texas, we’ll probably be talking quite a bit over the next years. Thanks so much for joining us. This is Democracy Now!, democracynow.org, The War and Peace Report. Go to democracynow.org for the first part of our conversation with Kiah and Forrest. Thanks so much.